Yakushima was registered as a Narural Property together with Shirakami Mountain Range in December 1993. The registered area is the forest of 10,747 ha which coves about 20% of Yaku Island. Main characteristics of Yakushima is vertical distribution of the plants. Miyanouradake (1936m) is the highest mountain in Yakushima and it snows on top. So, you can see the plants of every island in Japan from Hokkaido to Kyushu. That is why this island is called 'Alps on the sea'. Yakushima is famous for Yakusugi (cedar tree). Characteristics of Yakusugi is nonperishability. The land mainly consists of granite and the surface soil is very thin. So the cedar cannot absorb enough nutrient elements. By this reason and a lot of rain, the cedar keeps a lot of resin which makes cedar nonperishable. New cedar is born from stump or fallen tree. 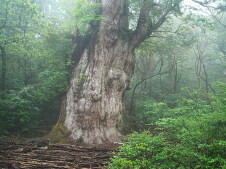 The oldest tree is Jomonsugi, cedar tree who is supposedly 7,200 year's old. The round trip to Jomonsugi takes about 10 hours walk. If it is too long, you may like to visit Yakusugi Land or Shirataniunsui Canyon where you can enjoy easy walk in the cedar forest. from 30 minutes. And Laurel Forest Zone called Seiburindo is the only world heritage area where you can visit by car. Sometimes you may encounter Yaku deer or Yaku monkey.